Two things I can probably guess about you right now - you're interested or at least a little curious about Stranger Things on Netflix, and ditto for video games. And if I'm correct, then I've got news for you: Netflix is publishing a Stranger Things game, and it's available now on iOS and Android. Stranger Things: The Game plays almost like an old-school Legend of Zelda game, only instead of bokoblins and dungeons, you're taking on shady government figures, dodging flashlights, and exploring the town sewers. The story is a quasi-recap of the plot from Stranger Things season 1, albeit with some embellishments for gameplay's sake. At least I don't think I remember any of the boys doing sweet flips to earn Eggo tokens, or Chief Hopper punching his way through a government lab filled with lasers... All told, there's at least 10 hours of gameplay, 7 playable characters to choose from, 6 'dungeons' and over 30 quests. 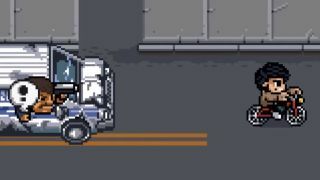 There's a few more action-oriented, side-scrolling chase scenes as well, but regardless of what you're doing, it's all presented in a throwback retro style. Not quite as retro as the show itself (season 2 takes place in 1984, meaning these graphics are way too advanced for the time) but it's still quite charming. The really good news is that it's completely free. No in-app purchases, no initial pricetag. I would say the game also lacks ads, but I mean... it basically is one big advertisement for season 2. And with the series set to return on October 27, that's fine by me!